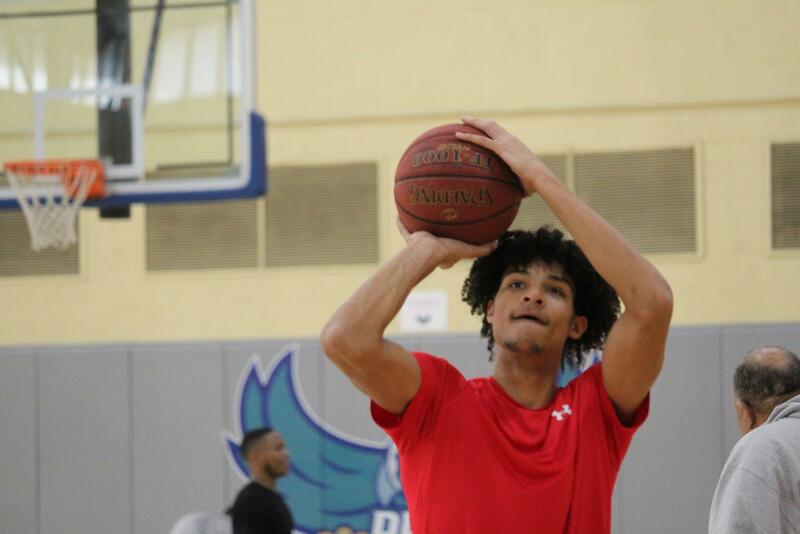 Deondre McNeill, one of AACC’s Men’s Basketball captains, shoots during a pre-season scrimmage. AACC’s Men’s and Women’s Basketball players said they look forward to the upcoming season after winning pre-season scrimmages in October. Men’s Basketball won a scrimmage against Delaware State University, 91-67, on Oct. 13, while Women’s Basketball won against Delaware Technical Community College, 50-47, on the same day. Women’s Basketball coach Lionel Mackell said he is pleased with his team’s performance, saying the women showed a lot of hustle and perseverance. “Across the board, there’s a lot of talent on both teams,” Athletics Director Duane Herr said. Second-year player Deondre McNeill, who took a break last year from the team to focus on his education, is back for a second season with the Riverhawks. The Women’s Basketball coach said his team has shown promise during practices and an early scrimmage. Sophomore Marcy Augustine, who is a guard for the second year, agreed. “Our first scrimmage was a big confidence booster,” she said. Both coaches said community college basketball is especially competitive. Women’s Basketball’s regular season will begin Thursday, Nov. 1, with a home game against Sinclair Community College. Men’s Basketball will play their first regular-season game on Wednesday, Nov. 7, against Thaddeus Stevens College of Technology.